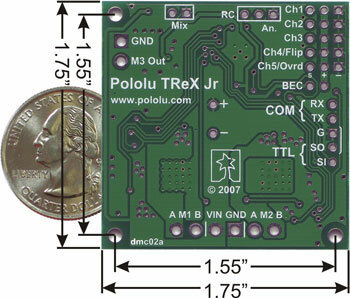 This lower-power, smaller, and lower-cost version of the TReX is the ultimate general-purpose motor controller for small motors. 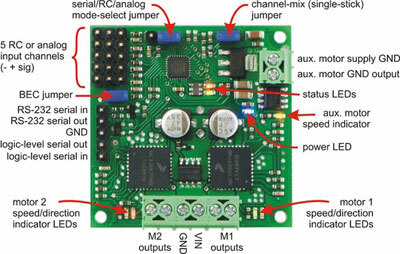 It has a wide operating range (5 to 24 V), delivers 2.5 A continuously per motor, provides current sensing on the two main channels, and it features the TReX triple interface that allows you to control motors from a serial line (RS-232 or TTL), radio control (RC) receiver, or analog voltage source such as a potentiometer. Using the compact MC33887 motor driver allows for a single-board design that reduces cost while maintaining a small package. As an added benefit, the use of the MC33887 motor driver allows operation to 24 V.
The TReX Jr has male 0.1" headers; for direct connection to an RC receiver or serial servo controller, we recommend ordering one 6" female-to-female cable, 12" female-to-female cable, or 24" female-to-female cable per channel you intend to use (the TReX Jr can use up to five channels).